– The Horsehead Nebula is a cloud of dark material blocking out the light of the red emission nebula IC434, that dominates the upper right of the image. The Horsehead Nebula is also known as B33, being the 33rd entry in E.E. Barnard’s catalogue of dark nebulae. It’s about 1,500 light years away. – The brightest star in this image is Alnitak, the leftmost star in Orion’s belt, as seen from the northern hemisphere. It’s more than 700 light years away, and is a triple star, whose brightest member is a hot blue supergiant. – The Flame Nebula is below Alnitak, which powers this emission nebula. Electrons in the gas get energized by ultraviolet light and release the energy as visible light. 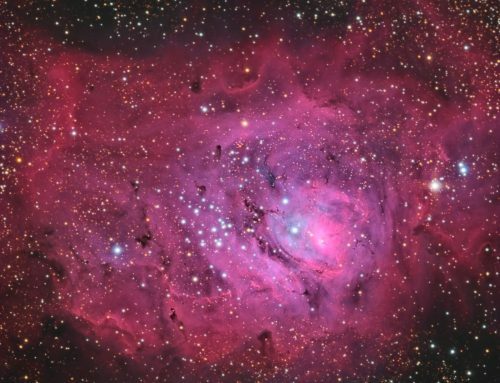 The dark areas are made of dark gas and dust lying between us and the bright part of the nebula. 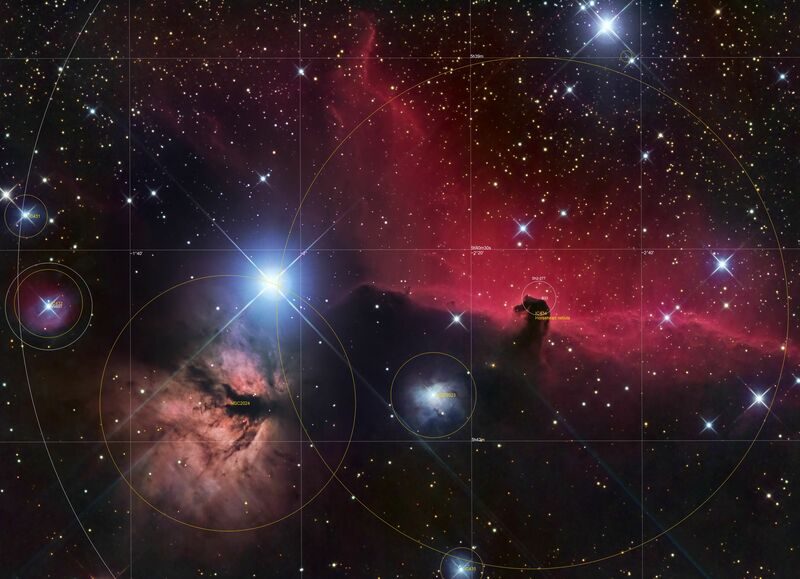 – To the lower left of the Horsehead Nebula is NGC 2023 (NGC is the revised New General Catalogue), a bluish reflection nebula. The pinkish areas in it are due to ultraviolet light causing molecular hydrogen to fluoresce, and the colour is quite different than the deeper red usually associated with hydrogen. Reflection nebulae do not glow with their own light, they are due to dust and gas reflecting starlight towards us. – Near bottom centre is another whispy reflection nebula, IC 435 (IC stands for “Index Catalogue” and there are two IC supplements to the NGC). – To the left of the Flame Nebula is an emission nebula with some reflection nebula to it. 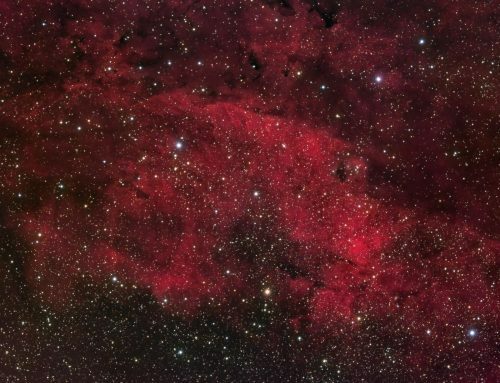 This is IC 432. Just above it is blue IC 431, a reflection nebula. 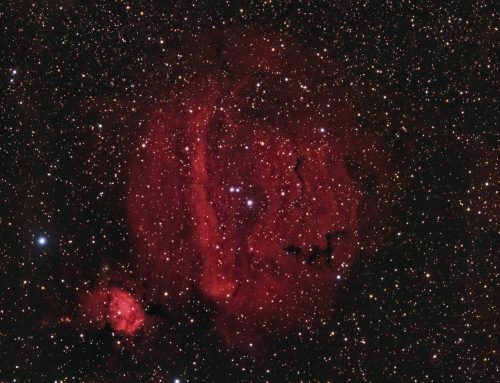 SBIG STL-11000M camera, Baader RGB and Ha filters, 10″ f/3.6 ASA astrograph, Paramount MX. Guided with STL-11000’s internal guider. Acquisition, guiding, and calibration using Maxim-DL. Image registration, integration and all processing in PixInsight. Shot from my SkyShed in Guelph, Ontario. Average transparency and poor seeing throughout. Gibbous to full moon for H-alpha, no moon during colour imaging. Acquired Feb 11-19, 2014. StarAlignment was used to align all calibrated frames. ImageIntegration followed by DrizzleIntegration was used to make the Ha, R, G and B masters. DynamicCrop was used to crop all the masters identically. DynamicBackgroundExtraction was applied to each master twice, first with Division and then with Subtraction. Stretching: HistogramTransformation was applied to make a pleasing, bright image. CurvesTransformation was applied to boost overall contrast and brightness. CurvesTransformation was used with a mask to increase saturation in the image’s highlights. Creation and cleanup of SynthL: The cropped and background-corrected R, G and B masters were combined using ImageIntegration (average, additive with scaling, noise evaluation, iterative K-sigma / biweight midvariance, no pixel rejection). Deconvolution: A star mask was made to use as a Local Deringing Support image. A copy of the image was stretched to use as a deconvolution mask. Deconvolution was applied (80 iterations, regularized Richardson-Lucy, external PSF made using the PSFImage script; Global dark deringing = 0.035). Deconvolution: A star mask was made to use as a Local Deringing Support image. A copy of the image was stretched to use as a range mask. Deconvolution was applied (80 iterations, regularized Richardson-Lucy, external PSF made using the PSFImage script; Global dark deringing = 0.035). Contrast Enhancement (Ha-only version): HDRMultiscaleTransform was applied to the Ha twice, at scales of 6 and 4. 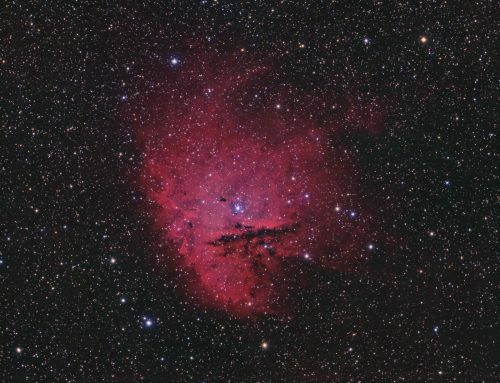 A mask was used to select bright nebula and protect stars, faint nebula and background sky. Contrast Enhancement: LocalHistogramEqualization was applied with a scale of 50 (max contrast 1.5, strength 0.3, 1 iteration), followed by a scale of 150 (max contrast 1.5, strength 0Sharpening: MultiscaleLinearTransform was used to sharpen Layers 2 and 3 with strengths of 0.15 and 0.11, respectively. 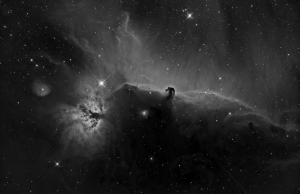 A mask was used to select only bright nebular features for sharpening..23, 1 iteration). A mask was used to select only bright nebular features. Sharpening: MultiscaleLinearTransform was used to sharpen Layers 2 and 3 with strengths of 0.15 and 0.11, respectively. A mask was used to select only bright nebular features for sharpening. Final Steps: Background, nebula and star brightness, contrast and saturation were adjusted in several iterations using Curves with different masks as required. Resample was used to increase the image scale from the DrizzleIntegration result of 1″ per pixel to the final value of 1.4″ per pixel. Very nice image as always, fantastic detail and color. Amazing detail with vivid colour. 11 hours of telescope time — how many hours of processing time?